On Westgate. I had just come out of Morrison’s, where I had spent and invested £18 on food and a bottle of their second cheapest Scotch. High Commissioner. At £11.75, or thereabouts, it is a good tasting help in times of trouble. I will be better off soon, but at these days I am poorer than I have been for a little while. I have been using my credit card for food and travel, and paying off the full amount just before the deadline, but I don’t think I can this month. If you build a rubbish mousetrap, but it is the only one you can buy, Mouse Eden! I have been away from home a lot. I live in an old back-to-back, which means hundred year old holes between the houses. This mousetrap is the only one I can buy in Bradford. 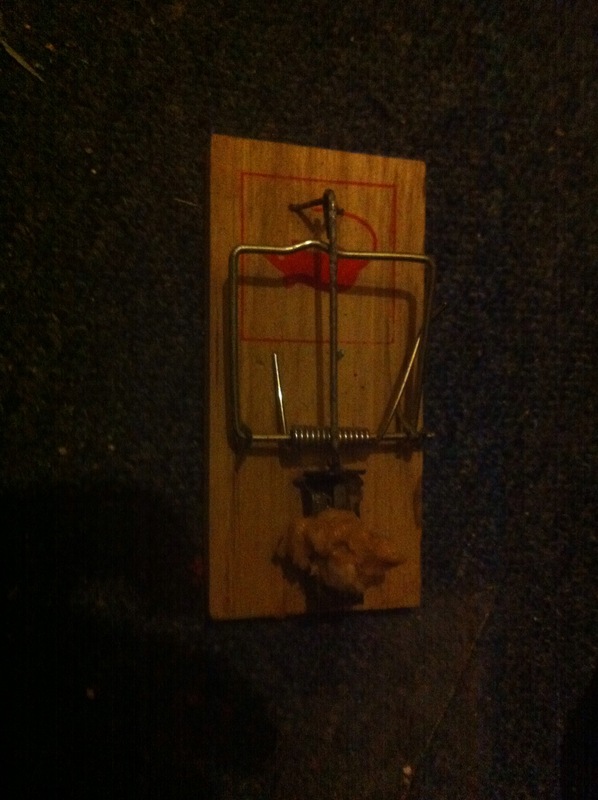 Most mice eat the bait and leave me wishing I could find a better mousetrap! I have found a brand of really good poison, but the wonderful hardware store in Leeds (I think it’s Mr Arkwright’s Tool Emporium) is the closest that always stocks it. I have had earplugs since next door had the always crying baby, so I have a coping strategy when the mices come back to my bedroom, but I’d rather not have mice. I have been thinking about getting a dog once the estate is sorted; but a cat might do more; and I did give lodging to cats for a dozen years of my life. Post Script2nd Feb 2016. I have just got the comment at the bottom from Dave, and discovered the comment above that from Sean from 2014!! Sorry for not responding earlier. It is one of the consequences of me using the free version of wordpress. I now buy Deadfast poison from the hardware stall in John Street Market/Oastler Centre. 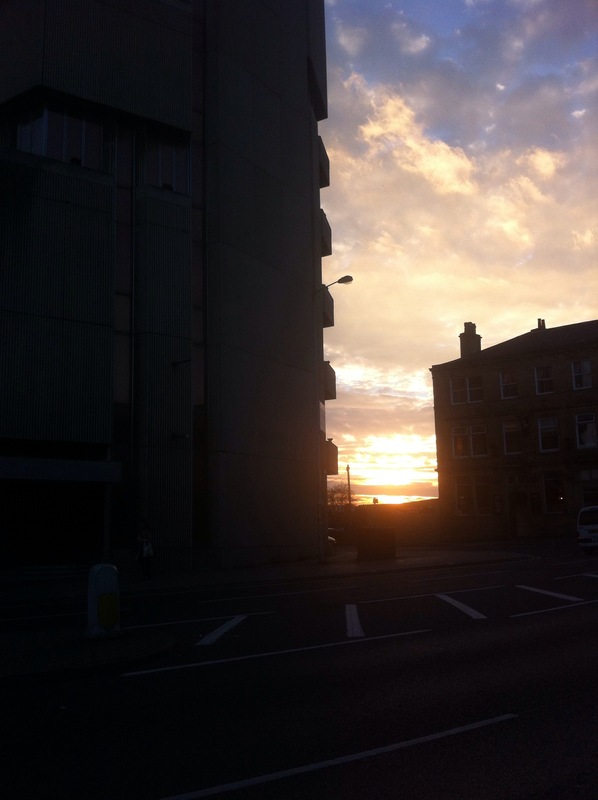 I photographed these on my way to Three Bridges station early last Saturday morning. 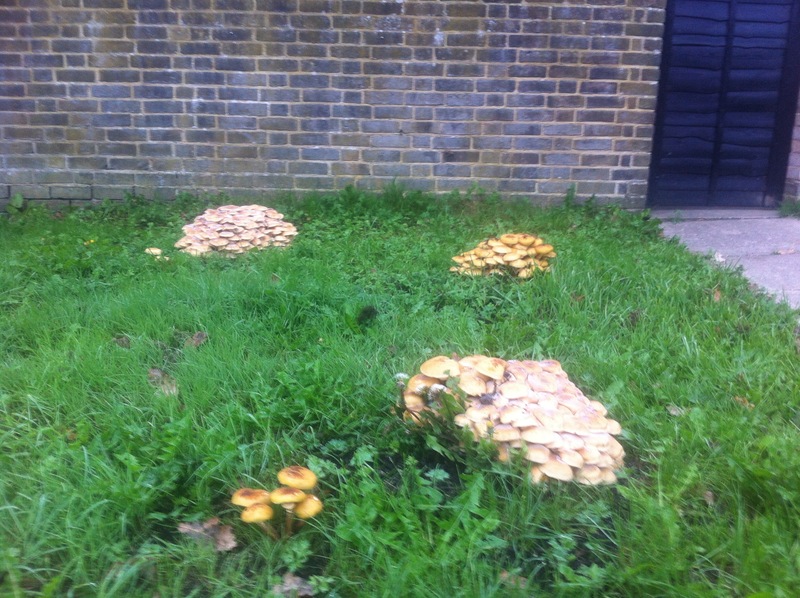 I think they are Agrocybe argirita Briganti, but my brother Basil (Mycroft to my Sherlock) will let me know if there is doubt. 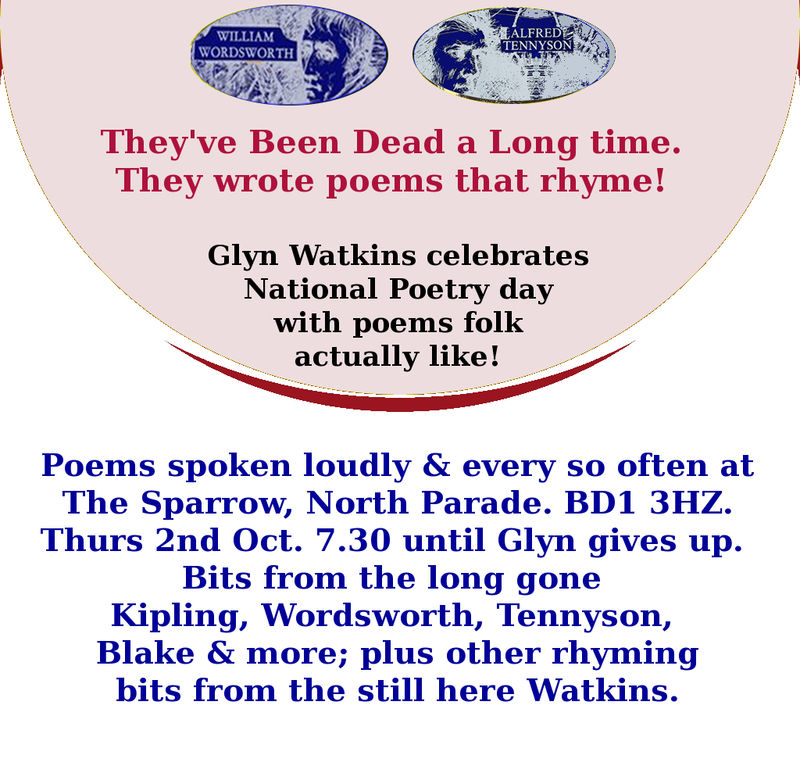 Glyn’s Poetry Show at the Sparrow this Thursday. They wrote poems that rhyme! Glyn Watkins celebrates National Poetry Day. With poems folk actually like. I cut my late mother’s lawn yesterday, almost certainly for the last time. 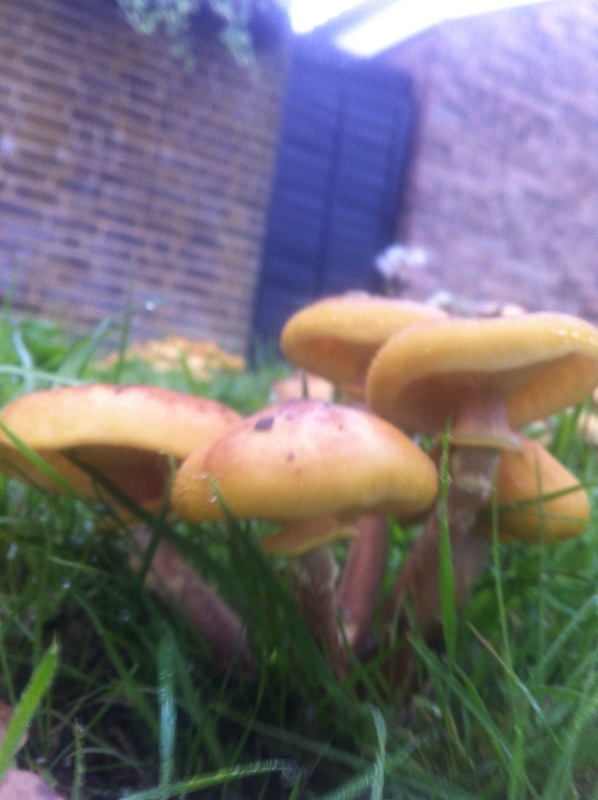 Unless there are phenomenal growing conditions there should be new owners when it next needs cutting. There is still a lot of work, but I am close to the point where I am emotionally able to pay someone to clear the place. I won’t, because I will always be tight, but it makes things psychologically easier. I have seriously investigated suicide a few times in my youth, many decades ago. If you want to kill yourself: just don’t. If you still want to kill yourself then not throwing yourself under any kind of train will lessen the number of people who hate you at your death by thousands. 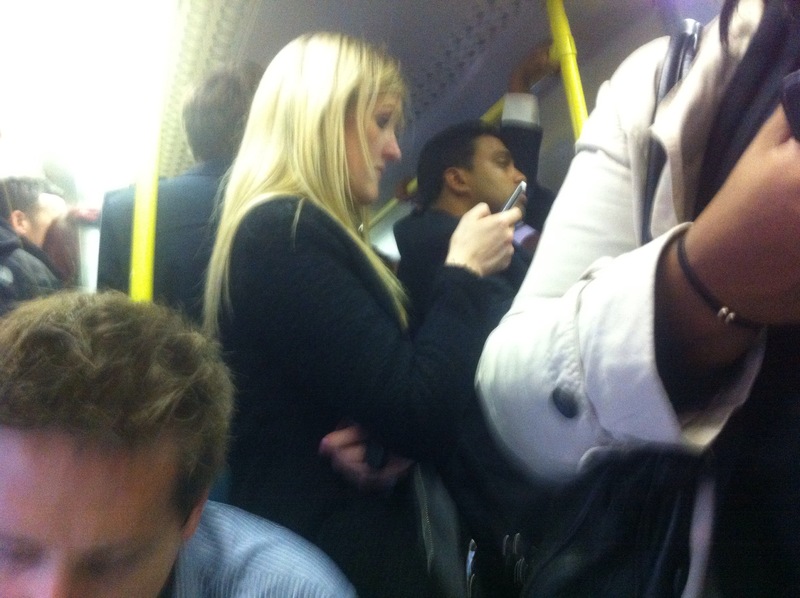 Many thousand in the South East of England.